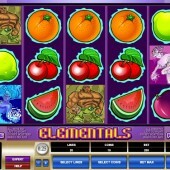 Like classic slots with lots of fruit symbols like melons, oranges and lemons? 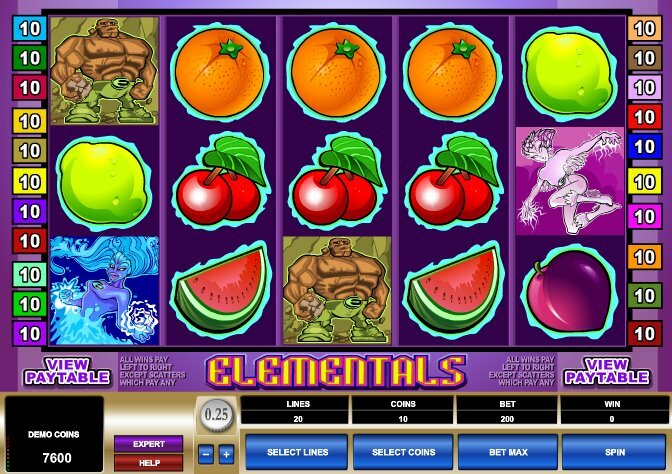 If the answer to both those questions is ‘yes’ you should probably clear out all your other online slots and head straight for your nearest Internet casino offering Microgaming’s Elementals, a journey into the world of heroes. And fruit. Yes, this slot will take you to places you have never even seen or thought of before. Whether that is a good thing will be your opinion but where else do fruit and superheroes combine to offer such entertainment?! Betting starts at just $0.01, and there’s an Expert mode – in classic Microgaming style – which allows the player to select Auto Plays. Taking the four elements– Earth, Wind, Fire and Water – as its inspiration, this 5 reel, 20 pay-line slot features four superheroes (the titular Elementals), each one gifted with the power of an element: Earth is a rock-wielding behemoth in the vein of The Fantastic Four’s Thing, Fire is a hero in the vein of The Fantastic Four’s Flame On....well, you get the idea. Elsewhere there are classic fruit machine symbols to accompany the heroes: oranges, plums, lemons and cherries fill out the reels, probably indicative of the battle between good and fruit, or something. The Wild symbol is the game’s Wild, and substitutes for all regular symbols in the game, other than the Scatter and Bonus symbols. A 5,000-coin jackpot is yours if you hit five Wilds across the reels, and Wild wins are doubled. 20 Free Spins Can Be Won! A lowlier 200x top payout on your bet is awarded if you hit five Scattered Crystal symbols across the reels in any spot. But it’s the ‘E’ icon that triggers the bonus round if you hit the symbols on reels 1 and 5. There, 20 free spins are automatically awarded, and wins are all doubled. Some nice animated touches, a very tasty Free Spins Bonus, and fruit – all in all Microgaming’s slot has everything you’d need from a modern-day online slot. I’m a sucker for fruit symbols, and I like that the game doesn’t get too bogged down in cumbersome bonus rounds like you get in other superhero slots like Cryptologic’s DC-Comics tie-in, Wonder Woman, or Playtech's Marvel Superheroes slot, The Fantastic Four. It’s obviously that latter band of do-gooders that Microgaming have been inspired by here, and who knows, perhaps we’ll see the Further Adventures of The Elementals tearing up an online casino near you sometime soon.